Réhahn is a world-renown French photographer, lauded for his human-centric portraits and travel photos. Motivated by a love for traveling and meeting others, Réhahn visited over 35 countries before settling in Hoi An, Vietnam. Though the setting varies, his method remains the same: spend time building relationships with others, then photograph them. His most praised works include the “Hidden Smile” collection: shots of Vietnamese people covering their smiles in modesty, and “Best Friends,” which depicts a young M’nong girl befriending and taming an elephant as is tradition in Vietnamese culture. These photographs have been featured in exhibitions and international media sources such as Time Magazine and National Geographic. 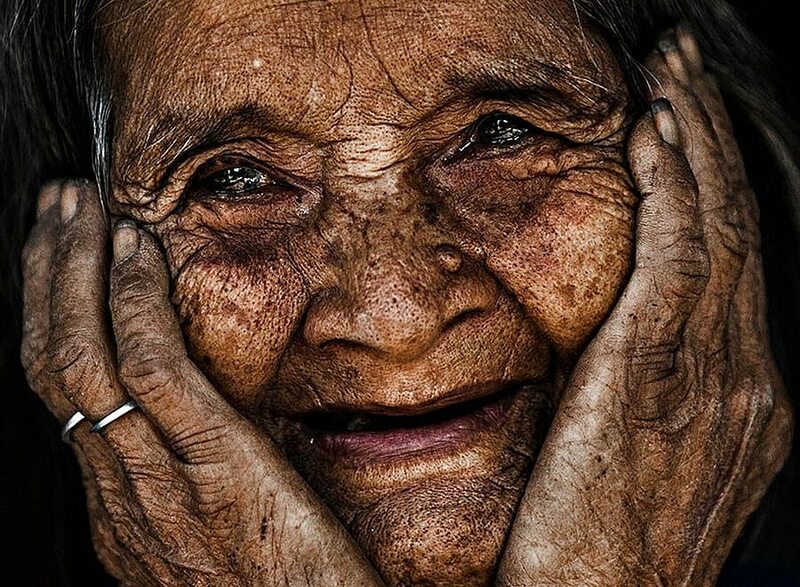 In this particular photograph, we see a close-up shot of a 103-year-old Rengao woman, glowing in joy with her hands clasped to her face. With her puffed cheeks and wide, contagious smile, we feel uplifted ourselves. Her skin is visibly wrinkled, dirty, and weathered, but her eyes remain particularly striking, sparkling in the light. As Réhahn says himself, the eyes are the window to the soul, and this woman’s brilliant, warm eyes reveal a satisfied and happy woman. I wonder what conversation she had with the photographer before this picture. I like to think she explained a rich life story, one that visibly inspired emotion and tears. In the end, she is altogether thrilled after reflecting on her life, as if to say it was well worth it. Is that what all of us should ultimately strive for? I would love to know this woman’s story, though so much of it comes across on her face!